Harm that is done to another person, or people, as punishment for what was done to the one who wants to get even for the suffering he or she has experienced: "Revenge usually stresses retaliation by the person, or those who were wronged or offended, and to pay back such actions with retribution or justified punishment." To inflict punishment in return for an injury or an insult: "Even though Jim paid the waiter, he revenged the humiliation that he suffered from the accusation that he didn't pay for the meal by never going to that restaurant again." A reference to being eager for retaliation against another for doing something wrong: "Mark was so upset that he felt revengeful for the insults that appeared in the newspaper suggesting that he mistreated his dog as he was getting ready for the dog show." Relating to an action of getting even for being emotionally slandered or greatly upset by another person: "When Jesse was publicly accused of plagiarizing the contents of his novel in a newspaper, he revengefully sued the publication for making such false accusations." 1. Complete or guaranteed, with no limitations, or restrictions attached: "Hank, the plumber, made an unconditional promise to fix the water pipes today." 2. Etymology: from un-,"not" + conditional, from Old French condition, from Latin condicionem, "agreement, situation"; from condicere, "to speak with, to talk together"; from com-, "together" + dicere, "to speak". A reference to not being subject to any restrictions; absolutely: "Marcus read over the contract for his employment and he signed it unconditionally knowing that is was a good job offer." Something that is impossible to be known before it happens or which can not be determined in advance: "Anyone who lives in the far North, the unpredictabilities of the wind and weather are things that people learn to live with." A reference to anything that is impossible to prepare for in advance or to know before it happens: "Examples of things that are too difficult to foretell or to foresee include: unpredictable test results, unpredictable weather, or unpredictable behavior." That which is incapable of being known in advance: "The unpredictableness of the mud from the high hill sliding down on the houses made it impossible for authorities to warn the people in time resulted in destruction of homes and several deaths of residents in that area." 1. 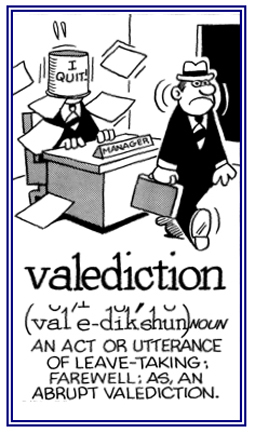 The action of bidding or saying farewell to a person, etc. ; a farewell or leave-taking: The office manager planned to say sincere valedictions to each member of her staff when she retired. 2. A statement, discourse, etc. made at, or by way of, a special occasion; frequently happening at a graduation ceremony of an educational facility: Charles Smith was the top academic student at school and he delivered the valediction at the close of the school year, praising not only the faculty but his fellow students as well. © ALL rights are reserved. "This truly will be an administration that looks like America, or at least that slice of America that got double 800s on their SATs. Even more than past administrations, this will be a valedictocracy, rule by those who graduate first in their high school classes." November 21, 2008; page 5. 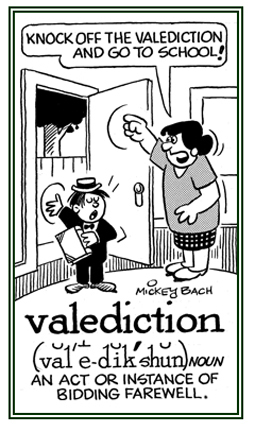 Someone who delivers farewell words or a speech on a special occasion: "A valedictor is a student who gives the closing address at a graduation ceremony of an educational institution, usually the one with the highest grade average in the graduating class." In colleges, schools, academies, etc., the student (male or female) appointed on the basis of merit to deliver the special oration on commencement day as part of the graduation ceremonies: "In an unusual turn of events, the university president appointed two valedictorians to speak at the end of the academic year because both of them had outstanding qualifications and achievements." A reference to an oral presentation when making a farewell or when going away: The president of the company gave a moving valedictory speech at her retirement luncheon. Showing page 9 out of 10 pages of 150 main-word entries or main-word-entry groups.